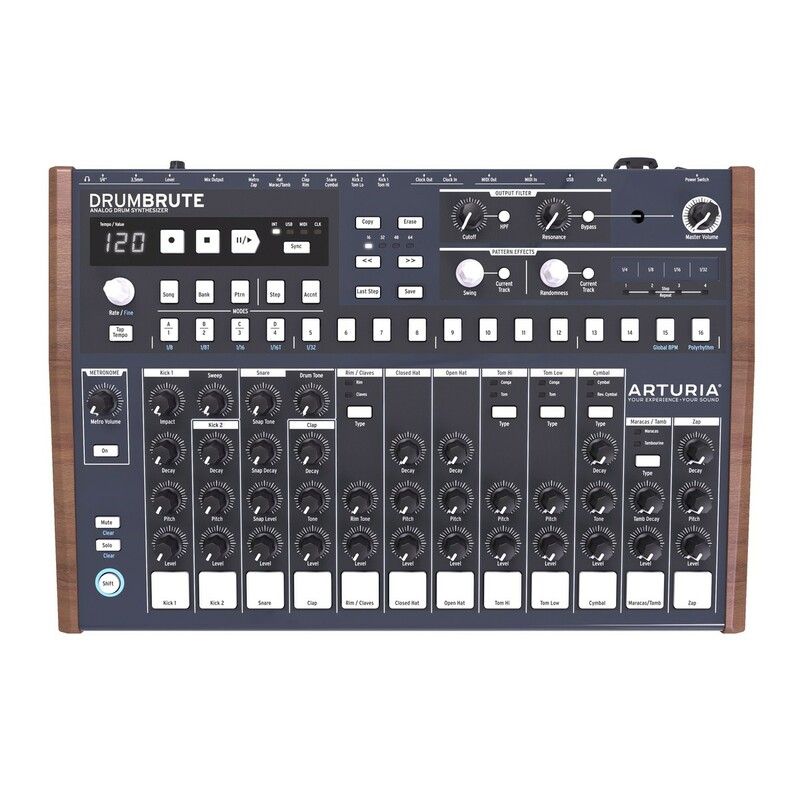 The Arturia DrumBrute Analog Drum Machine is a compact, versatile drum-synth featuring 17 analog drum and percussion instruments with a built-in 64-step sequencer. The DrumBrute Drum Machine's portable size makes it perfect for studio and live performances alike, allowing you to incorporate live finger-drumming into your sets and productions. The ergonomic layout and full-size controls allow you generate sounds and rhythms with ease, with 64 built-in pattern memories allowing you to create and store your custom patterns. 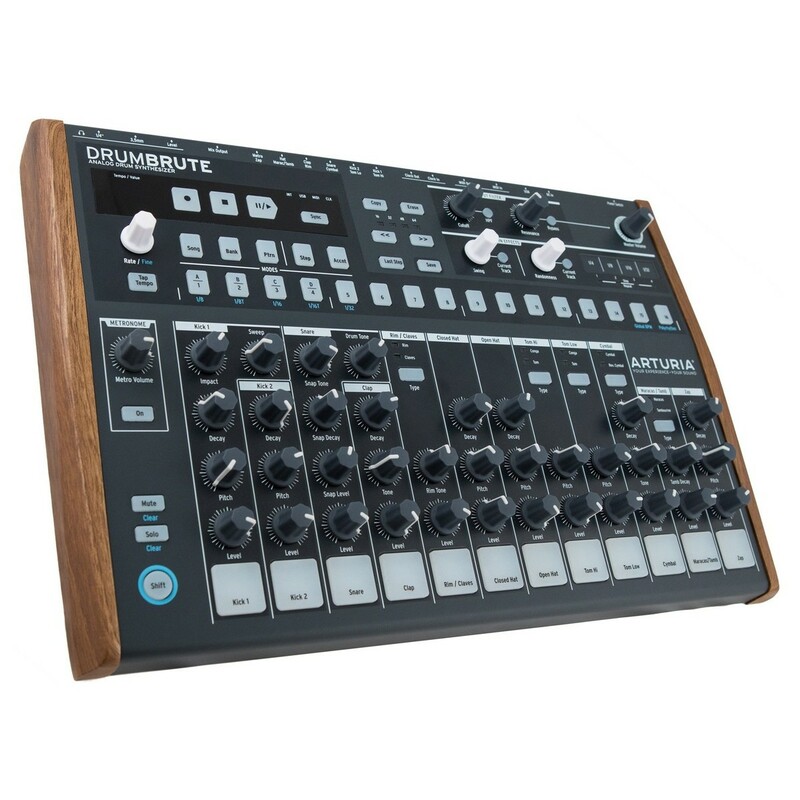 The DrumBrute also features USB/MIDI and Analog Clock I/O for added versatility. 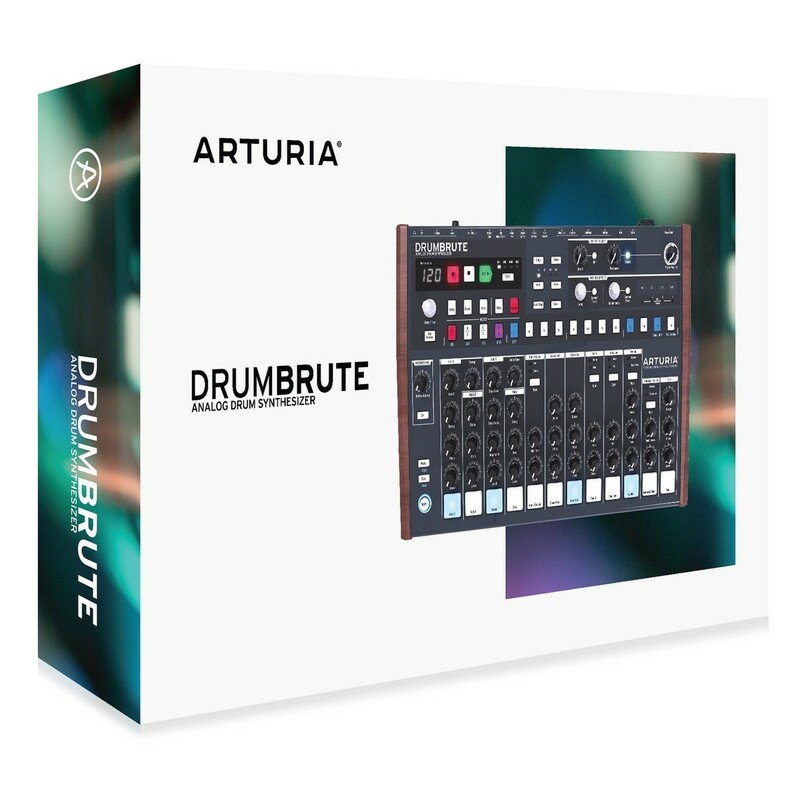 The Arturia DrumBrute Drum Machine features 17 fully analog drum and percussion instruments including: two kicks, snare, clap, open and closed hi-hats, high and low toms as well as conga, maracas, rimshot, clave, tambourine, zap cymbal and a reverse cymbal. This wide variety of different percussive instruments allows you to create intricate and interesting rhythm patterns with ease. One of the most unique features is the main output which includes a renowned two-mode Steiner-Parker filter. This filter allows you to add frequency sweep and bass drops with ease. Every drum sound also features multiple parameters that can be tweaked and edited to your desire, allowing you to create your perfect kit. 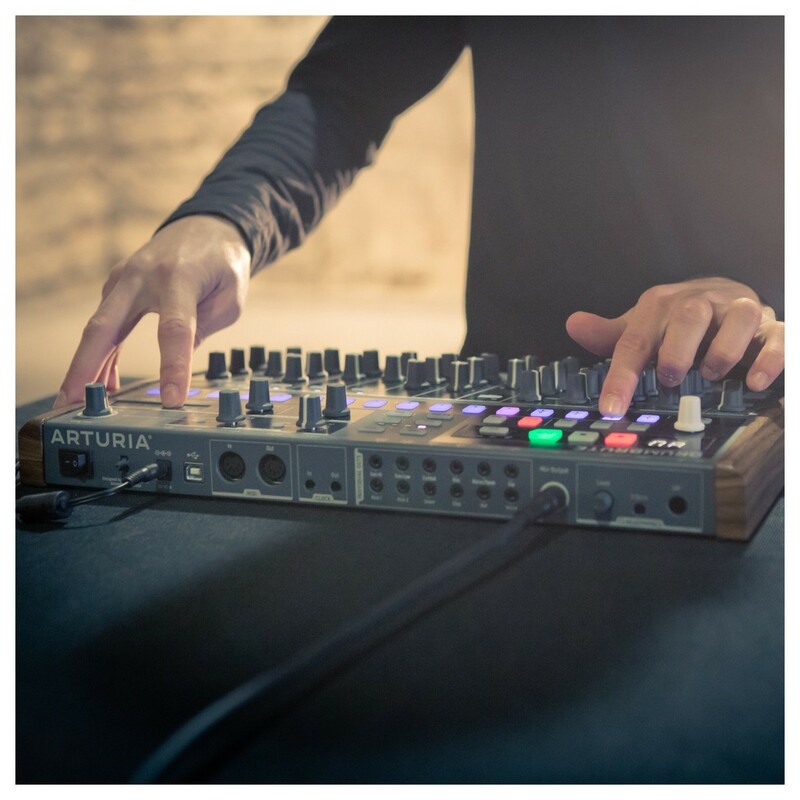 The compact and portable design of the Arturia DrumBrute Drum Machine makes it perfect for both studio settings and stage performances. The built-in 64-step sequencer allows you to use up to 64 steps, which can be chained together in song mode to create original performances. 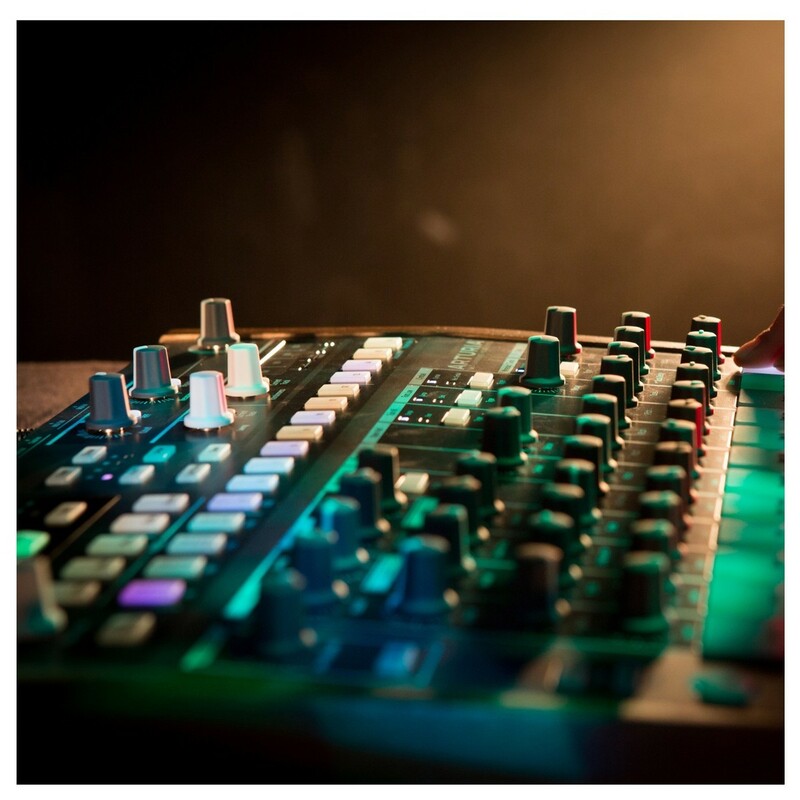 The DrumBrute’s layout features a dedicated button, knob or pad for every features available, allowing you to easily navigate between parameters while eliminating the need for tedious menu selections. Its rugged, chunky pads and sturdy knobs are highly reliable, ensuring optimal durability that will withstand the rigors of transportation and extensive use. The DrumBrute features a wide variety of effects and editing tools to add a new dynamic to your patterns and sequences. You can use the natural ‘Swing’ feature to add extra groove into your sequences, adding subtle time shifts to create a natural feel. The ‘Randomness’ function allows you to add in sporadic glitches into your sequences, while the Step Repeat, Roller and Looper functions allow you to mix up your rhythm entirely. These advanced features give you full rein over all your sequences and patterns, ideal for live performances. 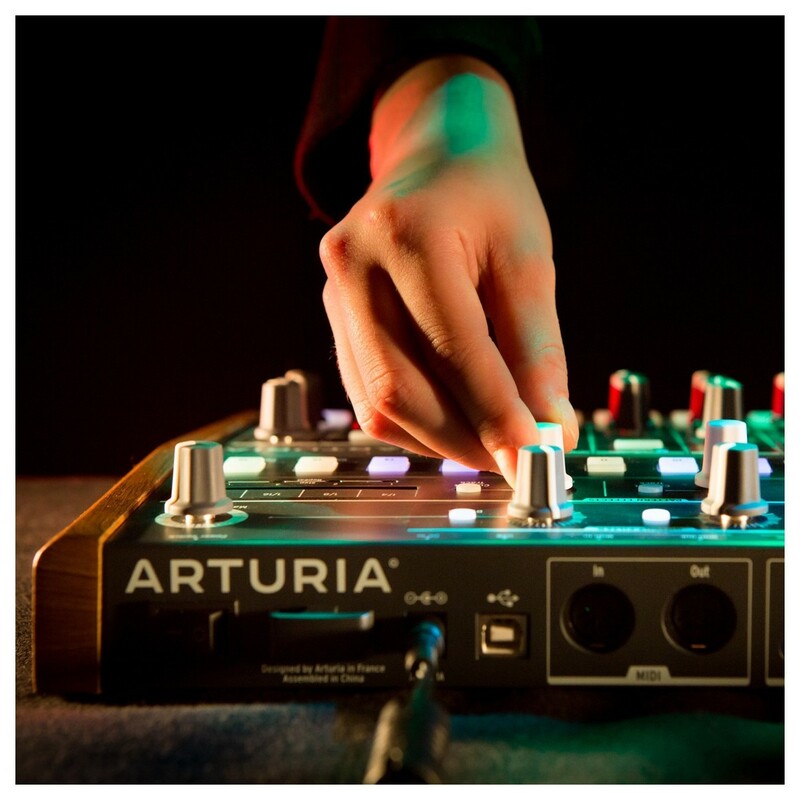 The wide range of performance effects and portable size make the Arturia DrumBrute ideal for both live performances and studio settings alike. The DrumBrute features a variety of digital and analog connectivity plus sync options including: MIDI, Clock, 1PPS, 2PPQ, DIN24, and DIN48. This allows you to integrate your DrumBrute in your existing setup and work with all your other modular, synth and sequencing units. 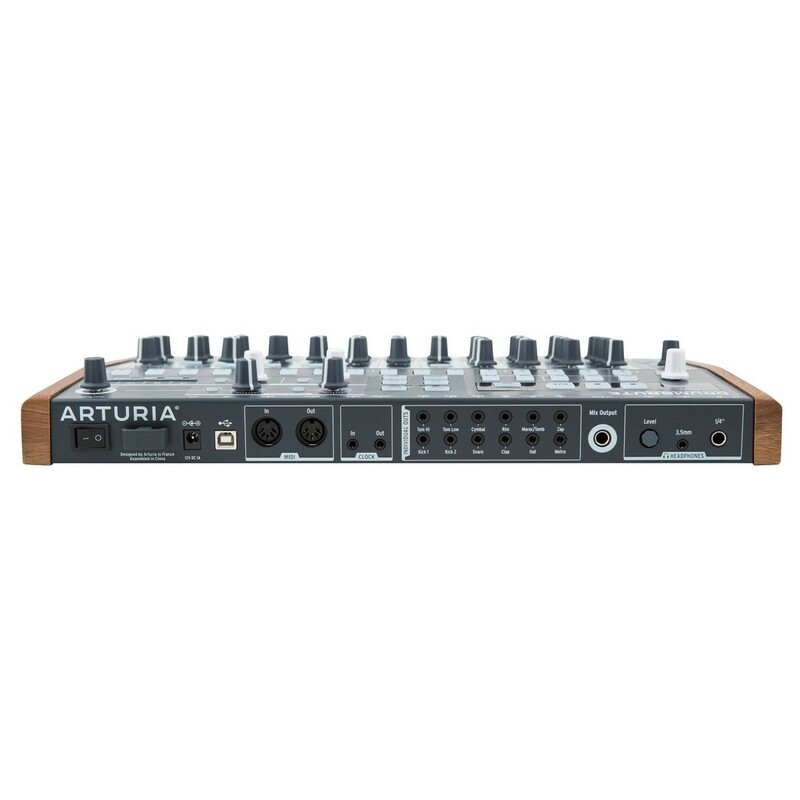 3.5mm and 1.4’’ headphone outputs are included to accommodate both headphone connection sizes, plus the USB and MIDI connections allow you to use the DrumBrute as a dedicated MIDI interface to control your favourite DAW.